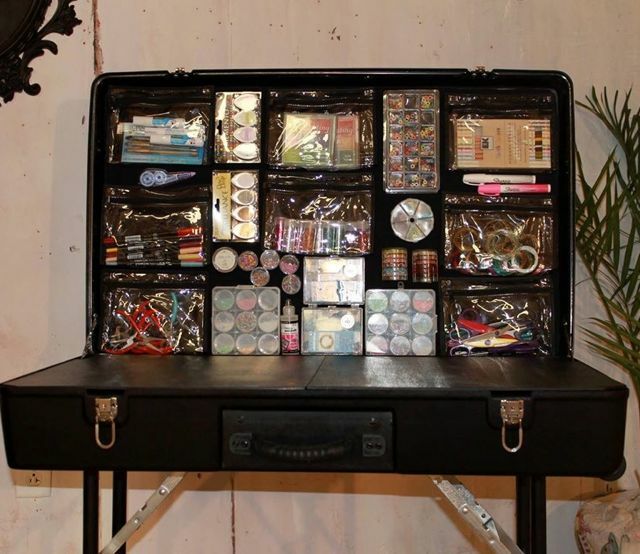 The Craft-N-Go Portable Art and Craft Workstations are perfect for the on the go scrapbooker, face painter, or crafter! Whether you are scrapbooking in your living room or getting together with your friends, the Art and Craft Workstation is perfect for all parties and events. They are great for indoor and outdoor usage. Set up in less than 2 minutes! Try the CNG Art and Craft Workstation and art storage containers and make your next scrapbooking event effortless. Craft Workstation Dimensions: 36" x 22" x 7"
Bottom tray storage capable of storing: - two 12 x 12 photo albums, or two reams of paper, or ANY storage containers less than 14 1/2 x 14 1/2 x 2"
Comes with an all metal inner and upper lid allowing for supplies to be attached using magnets. 10 magnets are included. Two - 11.75" x 11.75" x 2.5" storage compartments. Large, durable, wheels on one end, comfortable handle on the other. The Craft-n-Go Workstation and Paint Station are great ways to organize all your scrapbook supplies and set them up with ease. Your NEW Crafting Workstation is only one click away!